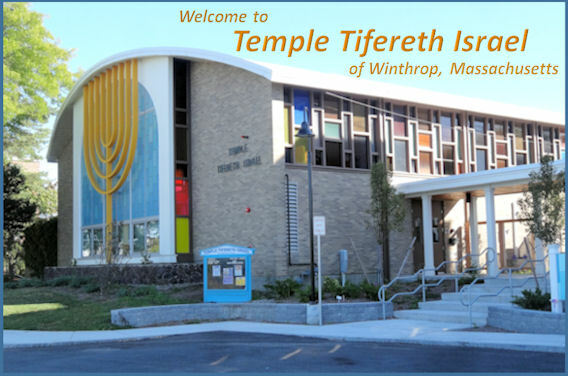 The Temple is located just north of Boston and is adjacent to East Boston, Logan Airport, Revere, and Chelsea. Winthrop has a population of approximately 20,000, is largely residential and is a peninsula with the Atlantic Ocean to the East and Boston Harbor to the West. Public transportation provides convenient low cost access to Boston, while road access to Boston, points west and south is provided by 3 tunnels below Boston Harbor. Points north of Boston, including New Hampshire and Maine, are easily reached by highways adjacent to Winthrop. There will be a Passover seder conducted at the Temple on Saturday evening, 20 April 2019. The cost will be $40 for adults and $20 for children 10 and under. Additional details are still being arranged. To reserve and/or obtain additional information, contact the Temple at 617-846-1390. This is great opportunity to enjoy a Passover seder without the bother of preparing and cleaning up. The seder is guaranteed to be a most enjoyable evening. Please make your reservations as soon as possible. The food order needs to go to the caterer very shortly. Our Temple celebrated the holiday of Purim last month, with three well-attended events. On Sunday, 17 March, the Temple's Hebrew School students took part in making Hamentaschen, the popular Purim pastry. In Israel, these pastries are known as "Oznayim Haman" or Haman's Ears. Erev Purim, on Wednesday evening, 20 March, nearly thirty people came to the Temple to join in reading the Scroll of Esther - the Megillah. The Megillah reading service was led by our Rabbinical Intern, Mimi Micner, and the reading of the Megillah was done by the attendees, in both Hebrew and English. After the service, refreshments were enjoyed by all. On Sunday morning, 24 March, the Temple held its annual Purim Carnival. The event was organized by the Temple's sisterhood. The attendees, particularly the children, had a fun-filled morning with games, refreshments and Purim costumes. Pictures taken at the event are shown below.